We had a jam-packed day (again) as we tried to get as much sightseeing in as we possibly could. I started the day with a 4 mile run. 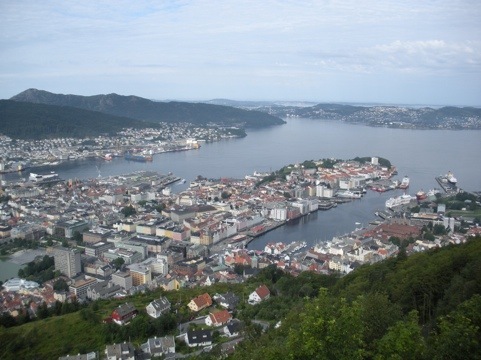 I didn’t find Bergen the best city for running, there are bills, construction and cobblestones. The stones especially didn’t mix well with the Vibram Fivefingers I was wearing. First destination this morning was a ride up the Flobanen Funicular. The funicular takes you straight up the side of a hill that offers a spectacular view of the city. We took a walk up at the top, finding a peaceful lake that featured the blondest little boy (maybe 2 years old?) playing with his mom, as she taught him how to throw stones. Kept us entertained watching him and hearing him giggle. After we came down, we got on a light rail train to go a about 7 kilometers south of town. 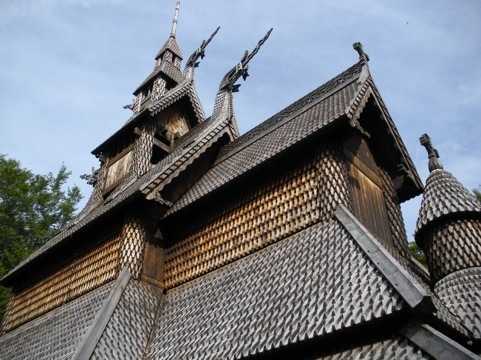 At first we got off and walked to the Fantoft Stave Church. It had been built in the 12th century, but was burned down in 1992 by a heavy metal Satanist. It’s been rebuilt, but it isn’t the same. Back on the light rail for 2 more stops, the next destination was the composer Edvard Grieg’s home. It was a 25 minute walk from the train. Hard to see Americans visiting somewhere that required that kind of walk. The museum was interesting, Grieg was important in the time Norway was becoming independent and looking for things uniquely Norwegian. 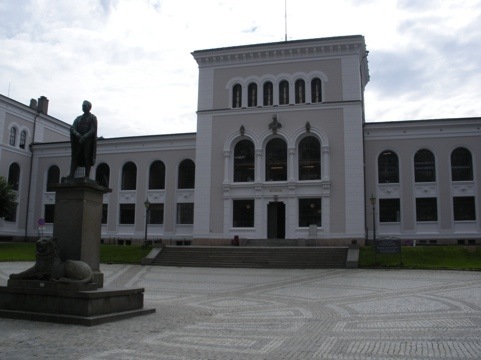 Upon returning to Bergen, we went to the Bergen Museum to see Viking artifacts and original carvings from stave churches. We dined casually tonight, sharing pizza and pasta at Pasta Sentral near our hotel. 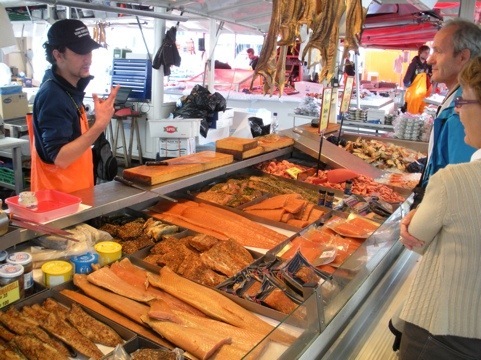 We then took one last walk past the fish market and by the shops of Bryggen. Some soft serve ice cream and we were ready to call it a day. We made a slight change of plans with the itinerary. 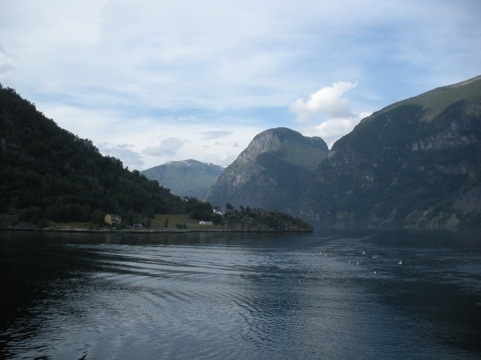 Originally we were looking to break up the drive from Bergen to Lillehammer by staying a night in Voss. 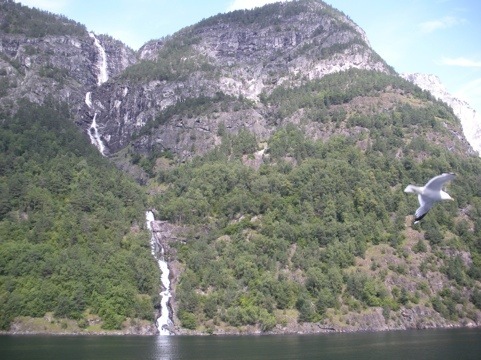 But Voss is just one hour from Bergen, so it wouldn’t help much. 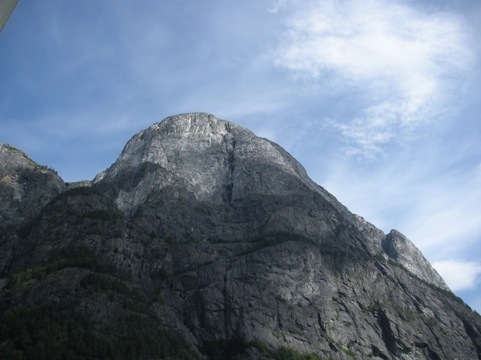 So we’ll stop in Voss for a short visit (Ellen for some reason is excited that Voss is the birthplace of Knute Rockne), and drive to Lillehammer tomorrow. That will give us a full day Saturday to see the Olympic site and other destinations. 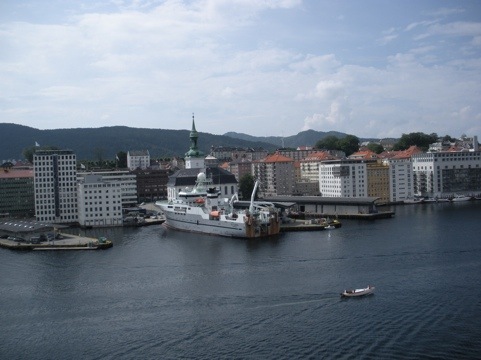 Today was for getting to know Bergen. We started with a walking tour of the city. That took most of the morning. We walked down to the old part of the city, Bryggen. This is a World Heritage site for the centuries-old wooden seaport buildings. We then went to the Rosenkrantz castle, which afforded beautiful views from the top of the harbor and city. Lunch was at the fish market, which has fresh fish, including whale, prepared any number of ways. The afternoon was dedicated to my wife’s favorite activity: laundry (also a favorite of Joan Brady if I recall corectly). In a bold experiment, we both brought only weekend-sized suitcases, so we knew we’d have to do laundry about half way in. We had found a flyer for a laundry mat at the Information center, so we hauled our laundry there. The proprietor was very nice, helping us figure out the machines. Now we can wear clean clothes for the whole trip! Somehow the laundry mat wasn’t listed in Foursquare. You better believe I fixed that. 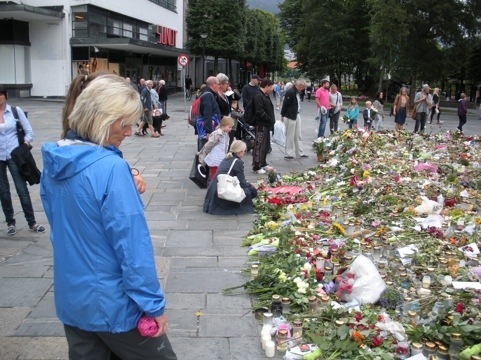 When walking back to the hotel with our laundry, we saw activity at the 22 July memorial. 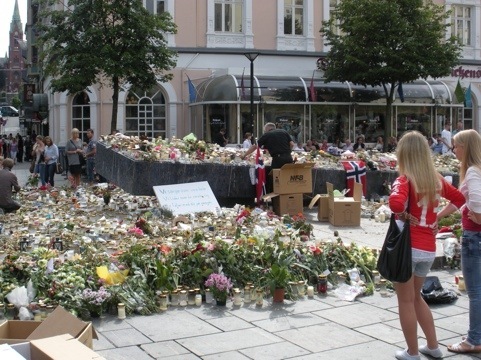 City personnel were gathering up flowers, cards and candles in boxes. They put a sign up to explain what they were doing, and acted in a careful and respectful manner. The sign indicated they would be saved for some sort of permanent remembrance. We later saw that they did this to reduce the size of the memorial. We went to 2 art museums, more Munch, with a Picasso and others thrown in. We chose a Vietnamese restaurant for dinner, it was away from the beaten path, less touristy and with delicious food. On the way to dinner, we saw a gathering in a nearby park. It was a car show, of ’60s era US cars. A funny site for us to come across in Norway. We found some ice cream and sat out by the water for a little while. It doesn’t get dark here until almost 11.